I’ve been lucky enough to work with patients who struggle with eating disorders for the past eight years. I adore my patients, and there are so many reasons why they inspire me. First of all, I chose internal medicine after medical school because I love the idea of caring for the whole person and collaborating with my patients on their health care plan. Patients tell me their story, their hopes and fears, and are the expert in themselves. I bring to them my expertise in medical diagnosis and treatment. Using language the patient connects with, and framing new or chronic medical problems in the context of each individual’s life, I give my patients a voice. This lets me be more responsive to what patients actually need from their doctor, so they don’t feel talked down to, rushed, or not seen. The mind-body connection is something I deeply believed in even before I started seeing patients with eating disorders. Who people are as individuals, set in the context of their culture, social experience, family, interests, values, and beliefs, privilege or lack thereof, absolutely affects their physical health. Nowhere are these themes more relevant than in the care of people battling eating disorders. I see how the Western medical system often silos body and soul. Body has to get cared for by one set of doctors, and soul gets cared for by a whole different set. Rarely do the two sets of doctors in their different silos get to communicate enough. I am so inspired by the ways that body affects soul, and vice versa, in patients with eating disorders. I get to listen to the whole story, the way that someone’s temperament, upbringing, societal expectations and pressures, and life experiences have directly influenced their physical health. I love being able to share with patients the objective evidence of their body’s suffering—both measurable and non-measurable—as a means of countering the eating disorder’s insistent whisper of, “You’re fine. Keep going.” Reuniting body and soul, while spending lots of time listening and understanding my wonderful patients as unique individuals, is deeply rewarding. In addition, I love the diversity of patients I see who struggle with eating disorders. 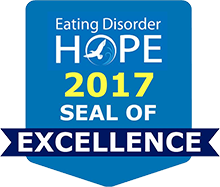 Eating disorders and their medical complications come in all shapes and sizes, and that refers literally to physical bodies as well as metaphorically to age, gender, life experience, race, temperament, and so many other aspects of life. There are special elements about each that inspire me. With younger patients, I’m inspired by what they have ahead of them in their lives, how treatment for their eating disorder will allow them to enjoy their birthright of school, a profession, partnership, friendship, and exploration of their interests. With older patients, I love to reflect back to them what they’ve already triumphed over and achieved, to help motivate their present struggle with their eating disorder. With those who have been sick a short time, it’s so much fun to introduce them to certain concepts of recovery and the mind-body connection, to inspire them to resist the eating disorder voice. And with those who have been sick a long time, I am grateful to explore with them what has worked and what hasn’t, and lean in even more to understand their values and motivations. My female patients speak to my fierce feminism, while my male patients speak to my commitment to underserved populations. In the eating disorder treatment world—much less society at large—males with eating disorders are often marginalized, underdiagnosed and undertreated, and have access to far fewer resources that speak to their unique needs. Many patients with eating disorders have experienced the message from people in their lives they are “too much”—too emotional, too needy, too sick, too sensitive, too complicated. My message back, and I’m talking to all you dear folks out there who are struggling with an eating disorder: You are wonderful, worthy, loved. You are a coin with two sides, like we all are. The bright side of your coin is extraordinary, with your intelligence, emotional precociousness, work ethic, determination, and drive. Sometimes such a bright side comes with an equally dark side of the coin…not bad, but harder to manage and less touted by society: the exquisite sensitivity to feedback, the intensity, the deep need for reassurance and recharge. The dark side of your coin probably hasn’t gotten as much support and praise as the bright side. You are a whole, real person, and the people in your life who love you have faith that you can be your whole self and live according to your values, free from an eating disorder.